In a hearing on Wednesday, senators probed Michael Williams, the new head of the Texas Education Agency, on student assessments and funding for remedial tutoring. 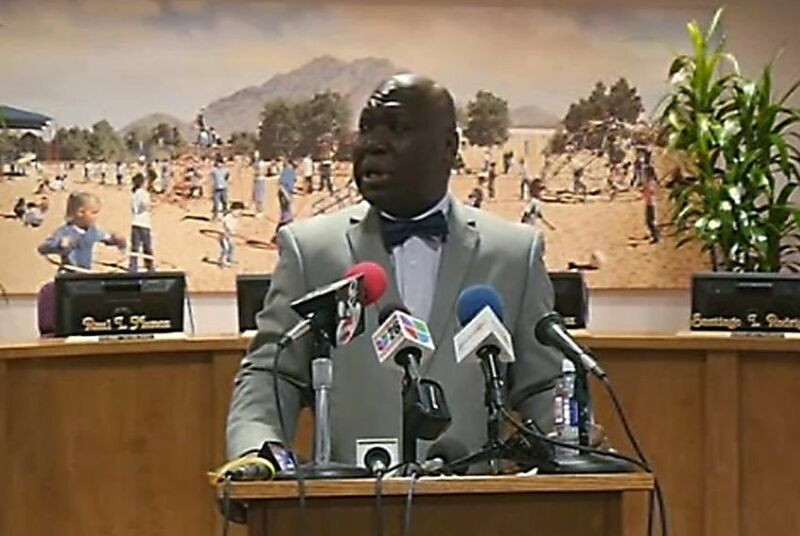 Texas Education Agency commissioner Michael Williams announces at a press conference that he is stripping all authority from the El Paso Independent School District Board of Trustees. The move comes in the wake of a cheating scandal that landed the former superintendent in federal prison. When Commissioner Michael Williams appeared before state senators Wednesday to ask them to add money to the Texas Education Agency's budget, they had a few questions of their own. Williams testified at the Senate Finance Committee's initial hearing on the $186.8 billion budget it released earlier this month, and among the commissioner's requests were another $22 million to fulfill "state and federal testing requirements" and the restoration of a proposed $2.6 million cut in funding for agency administrative operations. Senators took the opportunity to probe the new agency chief on his priorities for public education in the state — particularly in the areas of accountability and funding grants for pre-kindergarten and remedial tutoring. Gov. Rick Perry appointed Williams, who had served more than a decade on the state's Railroad Commission, in August. Williams took over an agency that was in the middle of navigating a rocky transition to a new student assessment system and had lost more than a third of its workforce because of state budget cuts in 2011. At Wednesday's hearing, Williams said the Senate's proposed reduction of an additional $2.6 million in funding to the agency — which would mean the loss of another 24 full-time employees — would be "extremely difficult to manage." "The agency is down, quite frankly, to bare bones now," he said. But lawmakers were more focused on the request for an additional $22 million in funding for assessment. Sen. Kel Seliger, the Midland Republican who chairs the upper chamber's higher education committee, kicked off the questioning by inquiring how much the agency currently spends on student assessment. A $468 million, five-year contract with Pearson to administer the state's new standardized exams has proven controversial amid a growing backlash against high-stakes testing in the state. "Is this $22 million just added to that $468 million?" asked Seliger, who is one of several lawmakers who has proposed legislation restructuring the current system. The subject arose again in an exchange with Sen. Jane Nelson, R-Flower Mound, who interrupted the commissioner as he was answering her question on how much the state spent on student testing. "I'm almost afraid to say this, but last year we gave 8 million tests," Williams said. After Nelson interjected to ask if that was too many, Williams responded by saying the Legislature should be proud of the rigor that the new student assessment system imposes, and that it encourages a focus on "every kid in every classroom." Unsatisfied, Nelson again asked if the state was testing students too much. "We measure what we treasure," Williams said. But he added that changes could be made in how tests count toward final grades or graduation requirements. "Right now that doesn't answer my question, which is, are we testing these children too much, and are we spending too much money?" Nelson said, before moving on. In his testimony, Williams also indicated that he would be unlikely to push for more funding for the Student Success Initiative, a program that provides remedial instruction for fifth and eighth grade students who don't pass state standardized tests and that was all but zeroed out in the 2011 budget. State law requires the commissioner to certify that the initiative has adequate resources for a ban on social promotion to take effect — and Williams' predecessor, Robert Scott, threatened that he would not certify it unless the 2013 Legislature restored that funding. When questioned by Sen. Royce West, D-Dallas, Williams was reluctant to endorse the program, which in the Senate's budget is funded at roughly the 2011 level. He said he thought the state could get "more bang with a different kind of paradigm," citing improvements in technology that allowed for online assistance for teachers in diagnosing whether students were learning the material. The commissioner offered a reason that the agency is not pushing for the restoration of more specialized grants that supported programs like Student Success Initiative and full day pre-kindergarten: The state is currently on trial in a lawsuit involving most of its school districts over the way it funds public schools following the 2011 Legislature's more than $5 billion reduction to public education funding. "There are any number of good or great programs the state has been funding," he said. But because of the litigation, he said, "it's prudent to see what the court is going to do."